The 1848 Revolution in France, sometimes known as the February Revolution, was one of a wave of revolutions across Europe in that year. The events swept away the Orleans Monarchy (1830–1848) and led to the creation of the nation's second republic. 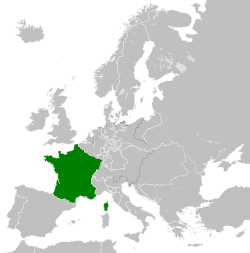 The Revolution of 1830, part of a wave of similar regime changes across Europe, had put an end to the absolute monarchy of the Bourbon Resturation and installed a more liberal constitutional monarchy under the Orleans dynasty and governed predominantly by Guizot's conservative-liberal centre-right and Thiers's progressive-liberal centre-left. But to the left of the dynastic parties, the monarchy was criticised by Republicans (a mixture of Radicals and socialists) for being insufficiently democratic: its electoral system was based on a narrow, privileged electorate of property-owners and therefore excluded workers. During the 1840s several petitions requesting electoral reform (universal manhood suffrage) had been issued by the National Guard, but had been rejected by both of the main dynastic parties. Political meetings dedicated to this issue were banned by the government, and electoral reformers therefore bypassed the ban by holding a series of 'banquets' (1847-48), events where political debate was disguised as dinner speeches. This movement began overseen by Odilon Barrot's moderate centre-left liberal critics of Guizot's coservative government, but took on a life of its own after 1846, when economic crisis encouraged ordinary workers to demand a say over government. On 14 February 1848 Guizot's government decided to put an end to the banquets, on the grounds of constituting illegal political assembly. On 22 February, striking workers and republican students took to the streets, demanding an end to Guizot's government, and erected barricades. Odilon Barriot called a motion of no confidence in Guizot, hoping that this might satisfy the rioters, but the Chamber of Deputies sided with the premier. The government called a state of emergency, thinking it could rely on the troops of the National Guard, but instead on the morning of 23 February the Guardsmen sided with the revolutionaries, protecting them from the regular soldiers who by now had been called in. On 23 February 1848 premier François Guizot's cabinet resigned, abandoned by the petite bourgeoisie, on whose support they thought they could depend. The heads of the more left-leaning conservative-liberal monarchist parties, Louis-Mathieu Molé and Adolphe Thiers, declined to form a government. Odilon Barrot accepted, and Thomas Robert Bugeaud, commander-in-chief of the first military division, who had begun to attack the barricades, was recalled. In the face of the insurrection that had now taken possession of the whole capital, King Louis-Philippe abdicated in favour of his grandson, Prince Philippe, Count of Paris claimed by Alphonse de Lamartine in the name of the provisional government elected by the Chamber of Deputies under the pressure of the mob. One party seeing that in spite of the changes in the last sixty years of all political institutions the position of the people had not been improved, demanded a reform of society itself, the abolition of the privileged position of property, which they viewed as the only obstacle to equality, and as an emblem hoisted the red flag (the 1791 red flag was, however, the symbol not merely of the French Revolution, but rather of martial law and of order). The other party wished to maintain society on the basis of its traditional institutions, and rallied round the tricolore. As a concession made by Lamartine to popular aspirations, and in exchange of the maintaining of the tricolor flag, he conceded the Republican triptych of Liberté, Égalité, Fraternité, written on the flag, on which a red rosette was also to be added. The first collision took place as to the form which the 1848 Revolution was to take. Lamartine wished for them to maintain their original principles, with the whole country as supreme, whereas the revolutionaries under Ledru-Rollin wished for the republic of Paris to hold a monopoly on political power. On 5 March the government, under the pressure of the Parisian clubs, decided in favour of an immediate reference to the people, and direct universal suffrage, and adjourned it until 26 April. This added the uneducated masses to the electorate and led to the election of the Constituent Assembly of 4 May 1848. The provisional government having resigned, the republican and anti-socialist majority on 9 May entrusted the supreme power to an Executive Commission consisting of five members: Arago, Pierre Marie de Saint-Georges, Garnier-Pagès, Lamartine and Ledru-Rollin. The result of the general election, the return of a constituent assembly, predominantly moderate, if not monarchical, dashed the hopes of those who had looked for the establishment, by a peaceful revolution, of their ideal socialist state; but they were not prepared to yield without a struggle, and in Paris itself they commanded a formidable force. In spite of the preponderance of the "tri-colour" party in the provisional government, so long as the voice of France had not spoken, the socialists, supported by the Parisian proletariat, had exercised an influence on policy disproportionate to their relative numbers. By the decree of 24 February, the provisional government had solemnly accepted the principle of the "right to work," and decided to establish "National Workshops" for the unemployed; at the same time, a sort of industrial parliament was established at the Luxembourg Palace, under the presidency of Louis Blanc, with the object of preparing a scheme for the organization of labor; and, lastly, by the decree of 8 March, the property qualification for enrollment in the National Guard had been abolished and the workmen were supplied with arms. The socialists thus formed a sort of state-within-a-state, complete with a government and an armed force. On 15 May, an armed mob, headed by Raspail, Blanqui and Barbès, and assisted by the proletariat-aligned Guard, attempted to overwhelm the Assembly, but were defeated by the bourgeois-aligned battalions of the National Guard. Meanwhile, the national workshops were unable to provide remunerative work for the genuine unemployed, and of the thousands who applied, the greater number were employed in aimless digging and refilling of trenches; soon even this expedient failed, and those for whom work could not be invented were given a half wage of 1 franc a day. Even this pitiful dole, with no obligation to work, proved attractive, and all over France, workmen quit their jobs and traveled to Paris, where they swelled the ranks of the army under the red flag. The socialist economic plan was straining state finances, and as the émeute of 15 May had proven that it constituted a perpetual menace to the state, the government decided to end it. After this, the June Days Uprising broke out, over the course of 24–26 June, when the eastern industrial quarter of Paris, led by Pujol, fought the western quarter, led by Louis-Eugène Cavaignac, who had been appointed dictator. The socialist party was defeated and afterwards its members were deported. But the republic had been discredited and had already become unpopular with both the peasants, who were exasperated by the new land tax of 45 centimes imposed in order to fill the empty treasury, and with the bourgeoisie, who were intimidated by the power of the revolutionary clubs and disadvantaged by the economic stagnation. By the "massacres" of the June Days, the working classes were also alienated from it. The Duke of Wellington wrote at this time, "France needs a Napoleon! I cannot yet see him..." The granting of universal suffrage to a society with Imperialist sympathies would benefit reactionaries, which culminated in the election of Louis-Napoléon Bonaparte as president of the republic. Henri Georges Boulay de la Meurthe was elected Vice President, a unique position in French history. A conservative electoral law was passed on 31 May. It required each voter to prove three years' residence at his current address, by entries in the record of direct taxes. This effectively repealed universal suffrage: factory workers, who moved fairly often, were thus disenfranchised. The law of 16 July aggravated the severity of the press restrictions by re-establishing the "caution money" (cautionnement) deposited by proprietors and editors of papers with the government as a guarantee of good behavior. Finally, a skillful interpretation of the law on clubs and political societies suppressed about this time all the republican societies. It was now their turn to be crushed like the socialists. Louis-Napoléon saw his opportunity, and organised the French coup of 1851. On the night of 1/2 December 1851, the anniversary of his uncle Napoleon's coronation in 1804 and his victory at Austerlitz in 1805, he dissolved the Chamber, re-established universal suffrage, had all the party leaders arrested, and summoned a new assembly to prolong his term of office for ten years. The deputies who had met under Berryer at the Mairie of the 10th arrondissement to defend the constitution and proclaim the deposition of Louis Napoleon were scattered by the troops at Mazas and Mont Valérien. The resistance organized by the republicans within Paris under Victor Hugo was soon subdued by the intoxicated soldiers. The more serious resistance in the départements was crushed by declaring a state of siege and by the "mixed commissions." The plebiscite of 20 December, ratified by a huge majority the coup d'état in favour of the prince-president, who alone reaped the benefit of the excesses of the Republicans and the reactionary passions of the monarchists. ^ Alec Vidler (1990). The Penguin History of the Church: The Church in an Age of Revolution. Penguin. p. 86. ^ Roger D. Price (2002). Napoleon III and the Second Empire. Routledge. pp. 1834–36. This article incorporates text from a publication now in the public domain: Chisholm, Hugh, ed. (1911). "France: History" . Encyclopædia Britannica. 10 (11th ed.). Cambridge University Press. pp. 801–929. Amann, Peter H. "Writings on the Second French Republic." Journal of Modern History 34.4 (1962): 409-429. Price, Roger, ed. Revolution and reaction: 1848 and the Second French Republic (Taylor & Francis, 1975). Price, Roger. The French Second Republic: A Social History (Cornell UP, 1972).